If you’re a Nepali R&B/Hiphop fan living in Kathmandu valley, you’re in for a treat this August. The line-up for Project X: Leap of Faith has now been revealed and it consists of some of your favorite Nepali artists based abroad. In a first, the UK’s event management company The Signaturee, is organizing a concert in Kathmandu. 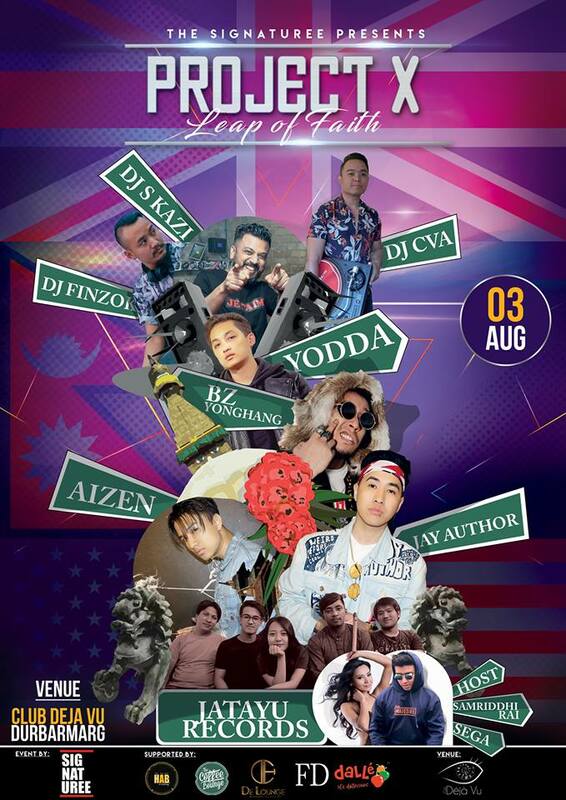 Powered by HAB a moment, the event will see the UK’s Nepali talents Jay Author, Yodda and Aizen along with the US-based rap artist BZ Yonghang of Baba G Society perform under the same roof. The concert also features Jatayu Records – the popular group that gives the international hits a Nepali touch in their covers. That’s not all, to make sure you keep dancing all night, DJ S Kazi, DJ Cva and DJ Finzok will be giving you the dose of EDM. The event will be hosted by ‘Prayas’ singer-songwriter Samriddhi Rai and YouTuber Sega Gurung. Scheduled to take place at Club Deja Vu in Kathmandu on August 3rd, the tickets for the event are priced at Rs. 3500 and Rs. 2500 for VIP and regular tickets respectively. A meet and greet with the artists will be organized ahead of the event. It will take place at Coffee Lounge in Durbar Marg on August 1 and no entry fees will be charged. Stay in loop. Follow the event’s updates on Facebook.